Presenting the Human Centered Business Index The Human Centered Businesses Index 2016 is a celebration of Swedish businesses – ranging from large corporations, medium size companies and social enterprises – that are all pioneers in business beyond sustainability. The Index was launched with a seminar at KTH Royal Institute of Technology! In addition to an interesting set of speakers, the event was attended by executives and leaders from the selected companies, the public sector as well as students and social innovators. More information will be posted shortly. 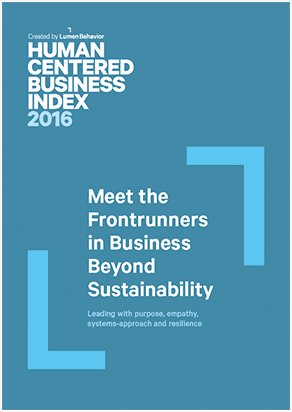 The Human Centered Business Index 2016 report is now avaliable for download now, and sign up for our newsletter for information on upcoming events. Sign up for our newsletter to get updates on future events and the ongoing dialogoue on the future of Human Centered Business in Sweden. Caroline Casey, motivational TED Speaker, award winning serial social entrepreneur is both an adventurer and business woman. 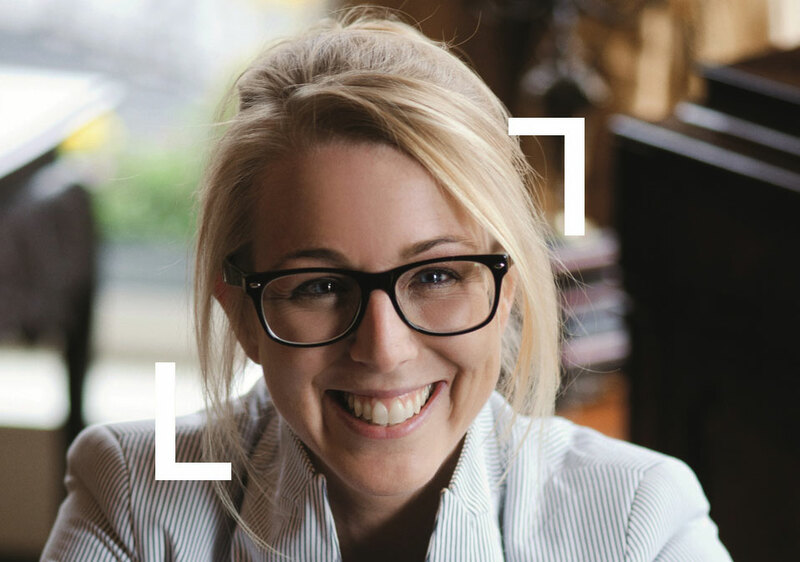 Subject of the National Geographic Documentary Elephant Vision, Ashoka Fellow, Young Global Leader of the World Economic Forum, TED speaker and unwavering campaigner, Caroline’s passion and ambition for leading a life without limits and labels is truly contagious. 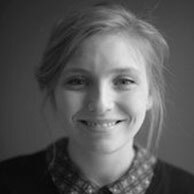 Since taking a life changing decision at 28 to leave her successful career as a management consultant and travel across India on an elephant, Caroline has been committed to building a global movement on inclusive business to build an equal society for the one billion people in the world with a disability. 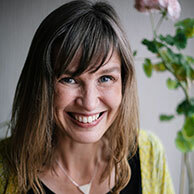 Collaborating with some of the world’s leading organisations and CEOs Caroline has identified what she often refers to as 'The New Green' – the new business imperative for success – Inclusive Business. An advisor, mentor, board member and international speaker Caroline has a real ability to connect with people. Her extraordinary personal story of coming to terms with her own hidden disability and turning that perceived 'weakness' into professional and personal success is relatable, funny, humbling and deeply meaningful. She is in her own words a 'dangerous dreamer' and someone who has leant the art of never giving up and 'failing fabulously'. Despite being the recipient of many awards and accolades, she believes true success only comes to those who can really be themselves. She says she is still working on it! Arne Karlsson is the now exiting Chair of Ratos, where he also served as CEO 1999-2012. Arne transformed the company to becoming an active owner, creating value by developing successful and sustainable companies in the Nordic market – and in doing so increased the value of the company by 1500 percent. Arne continues to develop businesses by serving in several Boards. He is Chairman of Bonnier Holding, Ecolean, Einar Mattsson, the Swedish Corporate Governance Board, SNS Board of Trustees (Centre for Business and Policy Studies) and the World’s Children’s Prize Foundation. As well as Board member of AP Møller-Maersk, Bonnier and Fortnox. The top companies of the Human Centered Business Index 2016 will be presented and celebrated at the March 15th event. Represented by their CEO each will share insights from their comptanies about leading with purpose, empathy, systems approach and resilience. Gregg Vanourek of the Royal Institute of Technology, Entrepreneurship & Innovation Division is moderating the seminar, where also Johanna Hallin, founder and Chair of Lumen Behavior, will be sharing insights from the first comprehensive study of human centered approaches in business in Sweden. The event will conclude in an opportunity to meet and discuss with the winners and speakers. At Lumen Behavior, we have scoped the Swedish business landscape far and wide – assessing for-profit business models of all types – to identify companies that stand out as champions in adapting a Human Centered approach in their business. In developing the Index we have used a combination of research, dialogue and a hand-picked nomination network to identify promising candidates. After assessing over 200 companies, we have found a top tier of 10 companies. These are the most impressive examples of human centered approaches. Purpose: Meaning derived from carrying forward values-driven work. Purpose is described and acted on in relation to core business. Actions of company align with a core purpose. Empathy: Empathy, or putting oneself in the shoes of the user, is embraced as a foundational element of better business and business communication. Empathy is embedded into initiatives of the company. Company is aware of the importance of empathy delivered to the entire marketplace - from customers, to employees, to the public. Systems Approach: Business moves away from “linear” thinking (focus is on fixing problems) to a “systems” perspective” (focus is on sustainability). Resilience: Adaptability, flexibility, and willingness to innovation and iterate in order to solve problems. To remain competitive, it is no longer sufficient to merely report on sustainability efforts. What is the next step beyond sustainability as it exists today? Version 2.0 of these efforts requires deeper connections to core the business. This means that companies are paving the way by being human centered. A human centered approach begins with a belief that all problems are solvable, recognizing that those facing problems carry the solutions. Adopting a human centered approach entails problem-solving and targeted efforts to prioritize diverse stakeholders – achieved through key values and principles such as purpose, empathy, systems-approach and resilience. Lumen Behavior partners with brave companies ready to become Human Centered in business and operations, by facilitating purpose, empathy, systems approach and resilience into decision making processes. Lumen Behavior is a boutique consulting firm with clients around the world. We leverages the core competencies of applied research, quality evaluation, impact reporting, strategic innovation and stakeholder dialogue to advance decisions that impact human wellbeing.